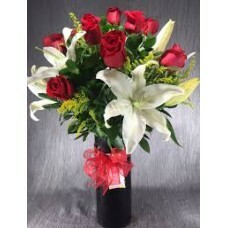 A chic display of a dozen fresh, long stem red roses adorned with white lilies! This is a classic Valentine's Day gift with a modern touch. Delivered in a glass vase, this bouquet is also a romantic standard for any day of the year or just a lovely present to show someone that you care.